Xcel Gold is the third level in the Xcel Gymnastics Program. 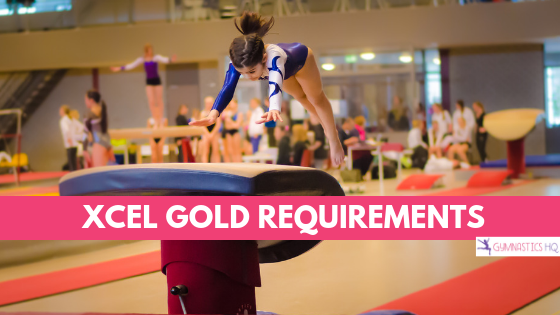 To compete gymnastics in the Xcel Gold Division, the gymnast must be able to do routines that meet these requirements, as stated in the Xcel Code of Points. These requirements are paraphrased for easier comprehension; for precise information always refer to the official book published by USA Gymnastics. The Xcel Gold division is one level in the Xcel program; here is more information about all the gymnastics levels. While these are requirements, some gymnasts compete in the Xcel Gold level without being able to do all the skills listed below. For what requirements gymnasts don’t fulfill, the judges take deductions. Gold gymnasts must perform a minimum of a front handspring vault. The next Xcel gymnastics level after Gold is Platinum. Quick question, on the bar routine do you need to get up on the high bar? can you compete a roundoff back handspring for 1 pass and a front tuck for the next? Thanks. A roundoff is not considered an acro skill, so you will have to add a back tuck to the end of your roundoff bhs. The front tuck is fine though. You can do a RBHS without a back tuck, because I am competing that this year and I am in gold level. Not trying to be rude tho it might be different at your gym. My daughter is under the impression that on the beam routine that there is a maximum amount of skills they can do. For instance.. She can do a cartwheel and a backward roll but isn’t allowed to have a hand stand in the same routine. Is this true? I think so, yes. Also, having less skills gives her less of a chance of falling. There won’t be any benefit to the score from having 3 acros. So just a follow up if you have any thoughts. What if she fell doing the first skill but did the second and “third” right. She would get deduction for the fall but wouldn’t she get points for completing the other two skills. So the program there depends on the exact nature of the fall (and how she’s been coached). For a skill to count for SR, you have to land it on the beam. Let’s consider the example of a back walkover. Say that the gymnast completes the back walkover, wobbles on the landing and falls. This scenario nets her a .5 fall deduction (max score possible now 9.5). Now let’s say she starts her BWO, gets to handstand, loses her balance and falls before she steps down. This results in both the .5 fall deduction AND, if she only has two acro in the routine, a .5 deduction for missing SR, as the BWO is not considered completed and won’t be counted as an acro skill (max score possible now 9.0). – or you can teach the gymnast that when she has a fall like this, she needs to repeat the skill and land it before she moves on with her routine, but this relies on her to remember what to do when still shaken up by a fall, and runs the risk of her falling a second time as well. A lot of coaches actually do neither, composing the routine with the minimum number of skills and relying on the gymnast to hit. Admittedly, it’s Xcel and not the Olympics, but not having a strategy can turn a fall from a .5 mistake you can recover from, to a 1.0+ mistake that can cost you the whole meet. There isn’t a maximum number of skills they can do, but most coaches choose to limit the skills because as Kaitlyn said, it will help her have a higher score since there are less chances for her to earn deductions. No, but coaches will likely only include her two best acro skills in the routine. If you would like her to have all three, you can just talk to her coaches about that. You can have a handstand in your routine. my two acro skills are cartwheel and a handstand. You do NOT need a backword roll you can have one but you dont need one. You only NEED a cartwheel and a cartwheel. Are each of the above considered A level and, if so, are we getting a deduction for having an extra A level skill? No, but you can get very tired from doing extra skills, so you should stay away from that. Is it possible to have to many non A skills there for getting a deduction for having bar skills beyond the xcel Gold level? . Ex. my daughter’s routine for xcel Gold is Kip – squat on – high bar kip – cast to 90 – back hip circle – fly away. If somebody in Xcel Gold does certain advanced skills (giants, clear-hip-circles, etc.) that are used in optional levels, then yes, they would receive a deduction. However, I have seen many girls doing the same routine as your daughter’s. A kip is commonly used, and almost every girl does a back-hip-circle. Fly-Aways are less common, but you are still allowed to use one. I would trust her coaches; they know what’s best! Hello! I’m curious, do gymnasts ever do the level 4 or 5 compulsory floor routines in Excel by choice? My daughter is 8 years old and an Excel Gold gymnast. Her gym doesn’t do JO until level 7, but I would love for her to progress to level 7 the right way. The gymnast is allowed to, since the xcel levels allow you to have your own routines, but you are not required to and coaches likely will not give your daughter those routines unless it it is requested by you. Can you do a round off-back handspring for one pass and an ariel for the other? You do NOT need a back tuck. back tucks are optional until level4/5 and above. You are allowed to do a tuck but it is not required. You’ll have to add a back tuck to your roundoff back handspring, because it is required to have a pass of two acro skills that both have flight, and a roundoff is not considered an acro skill. You can do a regular aerial though, because you are required to have a pass of either an aerial or a pass with a salto (back tuck and front tuck) included. A round off is a flight skill. The hands and feet leave the floor/beam at the same time. So is a dive cartwheel for that matter. There are many options for passes. Xcel is all about getting creative. You can compete a RBHS and a side aerial, I have competed that several times before without deductions. Can an Xcel Gold gymnast do a switch leap for their leap? You can do any kind of leap (including switch leaps), as long as it reaches a 120 degree angle. Hi, I am a silver gymnast, I don’t have a back walkover on beam or a kip on bars , will I still be able to get to compete gold this upcoming season. Thank you!!! Yes, you can!! Instead of a kip, you can do a pullover, and instead of a back walkover on beam, you can do a cartwheel or backward roll. No. You can do a pullover instead, but just know other girls will probably have a higher score for doing a kip, so you might want to learn one just in case. No, they won’t get a higher score if they do a kip rather than a pull-over because they are both considered “A” skills. What levels are Xcel Gold equivalent to? Xcel gold is about equivalent to level 4 but mostly level 5, depending on the difficulty of the skills you do. Xcel gold is about equivalent to level 5, maybe some level 4 depending on the difficulty of the skills you do. 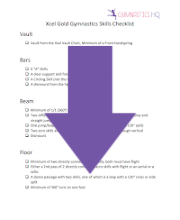 Is a roundoff over the vault table an acceptable Xcel gold vault? Yes, that would be a half on and you are allowed to do that. However, there would be deductions if your hands aren’t fully turned around when you hit the table. Do you have to have a back handspring? Yes, on floor you do have to. You would have to do a round off back handspring back tuck, but there are some other things you could do if necessary. I am competing xcel gold this year. Am I allowed to do round off back handspring back tuck and front handspring front handspring connection for my tumbling passes? I am competing as an Xcel Gold gymnast this year, but some of my teammates don’t have a salto or aerial in their routine. I am concerned that they’re starting score will not be high, but my coach says it will be fine. Should I take action or just go with what my coaches say? I kept falling off the beam with my cartwheel is there any chance I could do a handstand and backward roll instead? I only have to reach vertical in my handstand right? Yes you can. I’m competing a cartwheel and a backwalkover, but you only have to have a skill that passes through vertical and one other skill. Can I compete a back walkover back tuck dismount (connected) off of beam? Also is a beat jump aloud in my jump series? Hi, I was just wondering if i could do a Round-off Back tuck for my fist tumbling pass and a front tuck (or potentially a front-handpring stepout into a round-off) for my 2nd pass. My coach is a certified judge for USAG Gymnastics and she said we cannont do a roundoff handspring tuck is that true. And will two connected back walkovers be good enough for beam acro. Also how do ou get rid of an arch in your vault???? And yes a back walkover back walkover series would work fine. 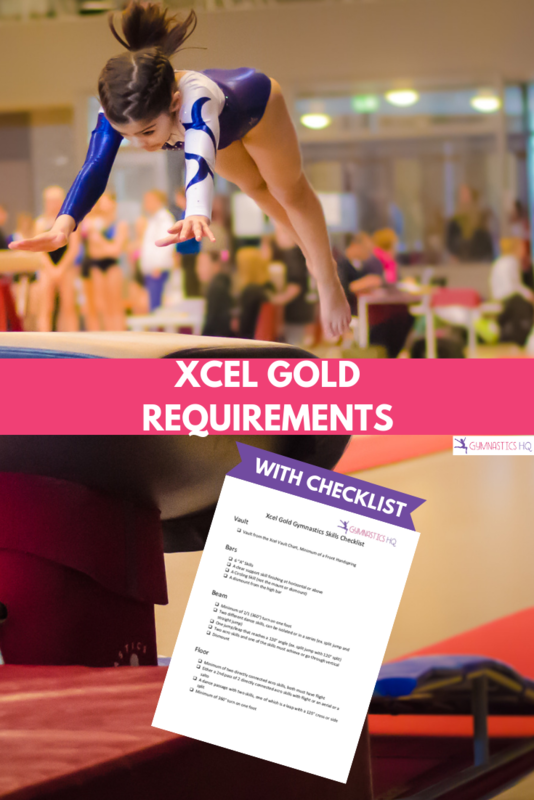 The requirements for acro in Xcel Gold is two acro skills with (at least) one going through vertical. Also the best way to not arch on vault is to do a arm circle into it (and squeeze the whole time), that will get your chest back and make it easier to hollow off the table. Yes, you can do a round off back handspring back tuck. You cannot do a back walkover back walkover because you need to have two different acros. Only one has to pass through vertical. And you can make your front handspring not arch by right when you pop leave your feet up and try to stay in the same position you were originally. You can do a double back walkover, you just need to have two acro skills with at least one of those skills going through vertical. Hi! I’m an xcel gold gymnast and i can do cast handstand so is that allowed in the routine ? No you cannot. That is not an “A” level skill. Its is a “B” level and is not allowed in gold. You can do it in level 4 though. 2 questions on excel gold can a spot be used on the floor for front tuck and can a backwards roll be done as an acro skill on the bean along with an cartwheel. So, I’m confused about the floor requirements for tumbling. Does a roundoff back handspring meet the requirement of two connected acro skills with flight? And can the second pass be the same as the first or do you need different skills? Thanks! Can I, in gold, have my first pass be a side aerial and the second and last pass a front tuck? then to the 7. Fly away? you would meet all of the requirements. @Ana My daughter completed level 4 in compulsory’s. Her coach suggested Excel Gold instead of Level 5 for her to get ready for optionals (Levels 6-10). Her thought process is that she will enjoy this season & it not be so repeatious from Level 4. Someone else may correct me if I’m wrong, I’ve heard from some parents of athletes who aspire to be a college gymnasts, that college coaches prefer Optionals over Excel Platinum. So I recently had tryouts for my gyms xcel team. Since the requirements are changing this year I don’t know if I would still be in silver. But I competed at another gym the yer before that did not have sanctioned meets, so even though I competed as a silver before I cannot count that season because the meets weren’t sanctioned. So, is there any way I could compete at one meet as a silver, and qualify for gold out of that, and become a gold for the rest of the season? Are you allowed to do a back handspring step out on beam for Gold? How long does your floor music need to be in xcel gold? Is it required to have a tuck in your routine? Or could I do a roundoff back handspring back handspring, and an ariel or front handspring? You do not need a tuck. Are the requirements above correct? I know there was an update to the Code of Points July 2018. My gym is waiting on the copy with the updates and my daughter has an appointment this week to create her floor routine. Hi, I have a question about the tumbling passes. Could I do a round off double backhand spring and then a front handspring, or would I have to do either a front tuck, back tuck, or ariel in one of the passes? Thanks so much. I think it has to be two DIFFERENT connected acro skills, so you would not be able to do that. But you may have to look at others’ routines to make sure You should check on USAG’s official rules site and see first. You can do a roundoff two back handsprings but your second pass can’t be a single acro skill that isn’t a salto/aerial. So you could either do a front handspring stepout front handspring or do a front tuck/side aerial for your pass. Does a dive roll qualify as a flight requirement for Gold? Hi. In regards to the Xcel level requirements for composing the routines. I notice that the Bronze and Silver were just updated in Aug I’m assuming because of the release of the new code of points. But the Gold, Platinum, and Diamond have not since 2014 and 2015. Is this because there has been no changes to these levels. Can I do a front handspring with a half twist entry for my vault? When were these requirements last updated? This summer. They are the new rules. am i able to do a switch leg leap for my leap pass on floor. Backwalkover, cartwheel, handstand, backward roll. Must do Cartwheel and handstand. Can do level four dismount, Round off dismount, side aerial dismount, and front tuck dismount. Front tuck, Aerial, Leap to 120 degrees, switch leap to 120, round-off 2 back-handspring, round-off back-handspring back tuck, front handspring step out front handspring two feet, front handspring front tuck. Pull over, Kip, cast back hip circle (cast must be horizontal), cast squat on, 3 tap swings to a tap swing dismount or flyaway, you can do long hand kip to cast back hip-circle under swing with 3 taps to tap dismount. Front handspring over table off of TABLE, round-off/half on off of the table, and you can do a half on half off. Thanks for reading!! Hope this was helpful!!! What is the deduction amount if you do a round off backhanspring and omit the back tuck? My daughter keeps freezing on it. You don’t need the back tuck. There are some girls from my gym that are only doing the ROBH. On the 2nd pass they are doing a front-handspring step-out to a round-off. a round off back handspring for my tumbling passes? 2. round off back tuck ? I am curious because obviously they are both back passes and I am unsure if gymnasts need both a frontward pass and backward pass. You do not need a front and back pass in xcel. Just have to have two passes that are different, but meet requirements. Some gymnasts are stronger back tumblers other front. That’s the great thing about xcel you can design routines to the gymnasts strengths. You don’t need a front tuck afterword. That may be too advanced. You can do a front-handspring step-out connected to round off as well. Or you can do one salto without the extra flight skill. (punch-front, side-ariel, etc…) Hope this helps! Can you start wearing grips in xcel gold? @ Marissa: as long as the freeze doesn’t lead to an execution deduction (eg. stumbling and falling) the only thing you should lose is the SR for one of your passes (.5 off start value IIRC). But if it’s giving you a lot of trouble, talk to your coach – there are plenty of other passes you could put in that place at competitions until you get the confidence to start going for the FHS front tuck – for example, an FHS step out to roundoff would fulfill any SR the FHS FT fills. @ MeiYuShan: grips are allowed at all levels of competition; if your individual gym has different rules you will have to talk to your coaches. Xcel Gold (and its roughly equivalent JO levels) is considered a good time to start switching from palm to dowel grips as this is when many gymnasts start doing work like bar changes, large tap swings, high casts, baby giants/long hang pullovers, etc. where the extra security the dowel provides becomes advantageous. Can my gymnast do a front tuck for her first pass, and then a connected front handspring front tuck for her second pass without getting any deductions? am i too old for this?im 12 years old and i meet all the silver and somewhat meet the gold requirements but am i too old to actually get anywhere?Do you think i could still get places with gymnastics? No! You’re DEFINITELY not too old! There are Gold gymnasts at my gym that are 9, 10, 12, 14, and 16! There are many different age groups at this level, so you’ll fit right in. Excel offers flexible practice times, so if you are busy with other activities in middle school, you can still compete. Ask your gym’s coach if you can try out. You’ll have so much fun! BTW, I’m in your same boat. But, I’m working as hard as I can. You shouldn’t feel too old! For Xcel Gold Bars, what are the allowable 6A skills? I know a kip is one, but are there others, my daughter is still working very hard on getting her kip. For Xcel Gold Bars, what are the allowable 6A skills? I am aware the kip is allowable is there anything else. My daughter is still working to get her kip. Might be competing Xcel Gold this year but we haven’t decided yet. For one pass could I do a roundoff back handspring, and on the other could I do a front handspring then connected to a round off? In Excel gold gymnastics is there specific floor music’s for gold…or can you choose any music you want?